We are excited to be in full production of E-Prime 3.0 this week! 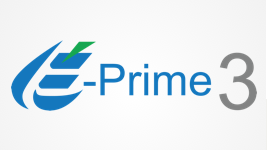 If you have any questions regarding E-Prime 3.0 features or ordering, please contact us. Our office will be closed next week for the holidays, however, orders will still be processed through our online store. Orders placed next week will begin shipping January 5th in the order they are received. E-Prime 3.0 introduces many new features for researchers to design their experiments even faster than before. E-Prime has always maintained an easy to use interface with little to no scripting necessary. New drag and drop sub-objects even further eliminate the need to use script for advanced experiment designs, such as buttons and sliders! Other additions include, an updated interface, Slide Layout Templates, an online experiment library, and helpful debugging tools.